Lockboxes are items which when purchased or claimed generate random items. Contains 300 Arkforge used by the salvage matrix to enhance gear. Contains 50 Arkforge used by the salvage matrix to enhance gear. Contains 500 Arkforge used by the salvage matrix to enhance gear. Bribe a 7th Legion representative. Gain 100 reputation. Small chance to gain a 7th Legion supply crate if they are feeling generous. Contains 4 random mods for the 7th Legion Fury synergy. Contains rare or better versions of weapons and gear manufactured by the 7th Legion. May also contain a samurai outfit or headgear. 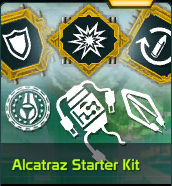 Everything an intrepid Ark Hunter needs to get a leg up on Alcatraz. Contains 3 Hunter Requisitions, 3 Chip Pullers, a random uncommon Cyber Rig, and 3 random uncommon Cyber Chips. This stash of gear should prepare you for your new life as an arkbreaker. Bribe a Chimera representative. Gain 100 reputation. Very small chance to gain a Caeruleum Core if they are feeling generous. Contains a rare or better random Cyber Rig and 3 rare or better random Cyber Chips. At least 1 Cyber Chip will be epic or legendary. Contains a random reward for Invasions. Bribe a Defiant Few representative. Gain 100 reputation. Small chance to receive a Defiant Few weapon if they are feeling generous. Contains one epic or better of the first run of the Defiant Few Crimefighter, Gang Buster or Bloodhound as well as 3 uncommon or better Defiant Few mods for those weapons. Defiant Few Vendor for reputation. Contains 1 random epic+ Defiant Few Mk II Weapon and 3 random uncommon+ applicable Mods with the Defiant Few Synergy. Awarded from Challenges. Contains one random mod. Bribe a Echelon representative.Gain 100 reputation. Small chance to receive a random Personal+ Boost. Salvaged from an arkfall, this lock box holds a random selection of gear. Contains 4 random items of at least rare rarity. Contains 4 epic-tier mods with standard synergies. Salvaged from an arkfall, this lock box holds a random selection of gear. Contains 3 random items of at least uncommon rarity. From a Defiance Data giveaway. Press your luck! This lock box contains 4 rare-or-better pieces of gear and a 50% chance of containing another lock box worth of gear. Seasonal Event - Available for a limited time during September 2013. Contains a random weapon mod, uncommon and rare rarities. Bribe a Paradise representative. Gain 100 reputation. Very small chance to gain a Caeruleum Core if they are feeling generous. Contains: 4 rare or better weapons and shields (At least 1 epic+ item). Guaranteed premium currency reward (Arkforge, Hunter Requisitions, Chip Pullers or Ark Keys) and 1 Consumable item or up to 100 additional Arkforge. ** IMproved chance to drop current jackpot legendary! Salvaged from an arkfall, this lock box holds a random selection of gear. Contains 2 random items of at least uncommon rarity. Bribe a Soleptor representative. Gain 100 reputation. Small chance to gain a Soleptor supply crate if they are feeling generous. Contains 4 random mods for the Scavenger Synergy. Contains rare or better version of weapons manufactured by Soleptor Enterprises. +11% Life and Shield Steal! Included weapon types: SS-2 Ranger, Blaster, Berserker, HP-6 Wolfhound, Blast Rifle, SAW and Tachmag Pulser. Bribe a Tarr Family representative.Gain 100 reputation. Small chance to receive a random Personal+ Boost. Bribe a Thorn Liro representative.Gain 100 reputation. Small chance to receive a random Personal+ Boost. Bribe a Top-Notch representative. Gain 100 reputation. Small chance to gain a Top-Notch supply crate if they are feeling generous. Contains 4 random mods for the Prepared Synergy. Contains rare or better versions of weapons manufactured by Top-Notch Toolworks. Bribe a VBI representative. Gain 100 reputation. Small chance to gain a Gunslinger or VBI supply crate if they are feeling generous. Contains 4 random mods for the EGO Precision Synergy. Contains experimental Von Bach weaponry, and Gunslinger outfits. Contains rare or better versions of weapons manufactured by Von Bach Industries. Provides a complete kit for a single weapon. Contains 1 weapon and set of mods for that weapon. Limited time box contains 1 epic or better weapon and 3 mods from rare to legendary (At least 1 epic or better), all with the limited Sustained Suppression mod synergy! EGO power grants an additional 10% damage and fire rate!